Sculptors, writers, fiber artists and stained glass artists, painters, costume designers, and dancers live here in St. Petersburg's Historic Kenwood, a small neighborhood district defined by brick cobblestone streets, hexagonal paver sidewalks and distinctive Bungalow and Craftsman-style homes from the 1920s and ‘30s. The neighborhood, bordered by 9th Avenue North and Central Avenue, and 19th Street North and 34th Street North, has the highest concentration of Craftsman-style homes in Florida and was named to the National Register of Historic Places in 2003. Michael Baker, liaison and artist, and his wife MJ Baker, also an artist, both with the Artist Enclave of Historic Kenwood. In 2014, as a testament to the growing number of creative people who were moving to the area, the City of St. Petersburg gave approval for Historic Kenwood to become an officially sanctioned Artist Enclave Overlay District. The designation gives local creatives permission to make artwork in garages, porches, spare bedrooms, and backyard studios. It also gives them the approval to sell their artwork and teach classes from home. “We call ourselves the neighborhood of the arts -- where art lives,” says MJ Baker, a fiber artist and former liaison between the Artist Enclave of Historic Kenwood and the Historic Kenwood Neighborhood Association. “Artists are allowed to create art in their own space at home; it’s very organic with a mix of small-scale home businesses,” says Baker, who is also the secretary of the Historic Kenwood Neighborhood Association. Today there are about 60 artists who are members of the artist enclave, including several with international reputations, such as fine artist Steven Kenny and installation artist Ya La’Ford. An artist is defined by the City of St. Petersburg Arts Enclave Overlay District guidelines as an individual who creates a product in one of the following categories: Fine Art, Craft Art, Design, Photography, Filmmaking, Musical, Literary or Performing Art. That includes artists whose craft is book cover design and layout, mosaics, woodworking, jewelry, theater design, and writing plays. 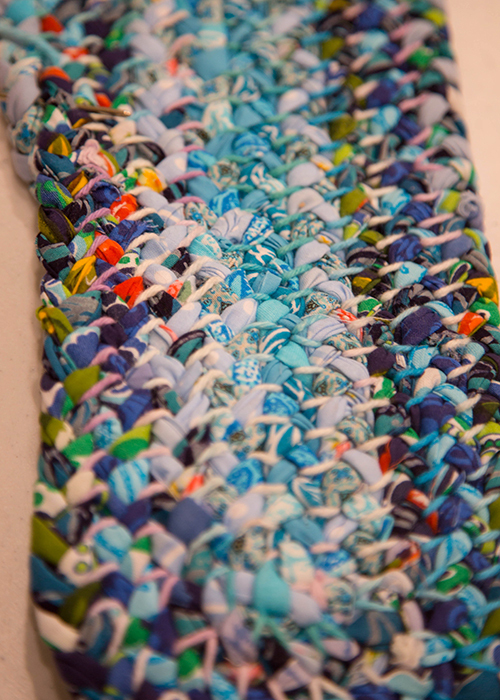 A handmade rag rug in the early stages created by MJ Baker.Creating from home has obvious advantages, including not having to pay for rental space and definitely saving on the commute. But there could be some concern among the neighbors. appointments to four per day and limiting the number of artist enclave-sponsored events per year. There is also a noise ordinance. Walls and fences are required around the property and kilns must be set back at least 10 feet from the lot line. Baker credits both the LGBT community and historic preservation specialist Bob Jeffrey with helping transform Historic Kenwood into the thriving neighborhood it is today -- and with pursuing its arts enclave designation. Designation as an artist enclave has helped raise the community’s visibility, says Baker, and allows the continued revitalization of the neighborhood’s many historic homes by people who recognize their value. It has also been a useful economic development tool for the artists in helping generate greater awareness of their work. That’s especially true of the annual Artists at Work in Historic Kenwood Tour, held in March. This year’s tour on March 16-17 was the organization’s 4th annual event, and the most successful to date, says Baker. Twenty-one artists showcased their work at 12 different homes. “Not everyone who came on the tour purchased a piece of artwork, but that was not the point. It was about seeing the artists working in their studios,” says Baker. In fact, Baker hosted two hands-on art activities for tour participants -- a session working with hot glue guns and stencils and a craft workshop making an impression of a leaf or flower on a piece of cotton fabric. “People loved it; it made the tour personal and they got to make something for free and take it home with them,” says Baker. in a golfing community in New Port Richey. 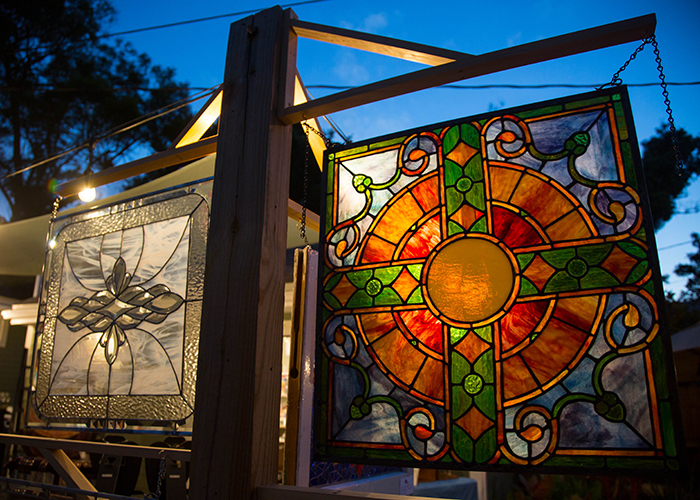 Stained glass pieces made by artist Michael Baker, liaison of the Artist Enclave of Historic Kenwood. Originally from Lansing, MI, MJ had been a high school drama teacher, and Michael was an electrician for the local GM plant. 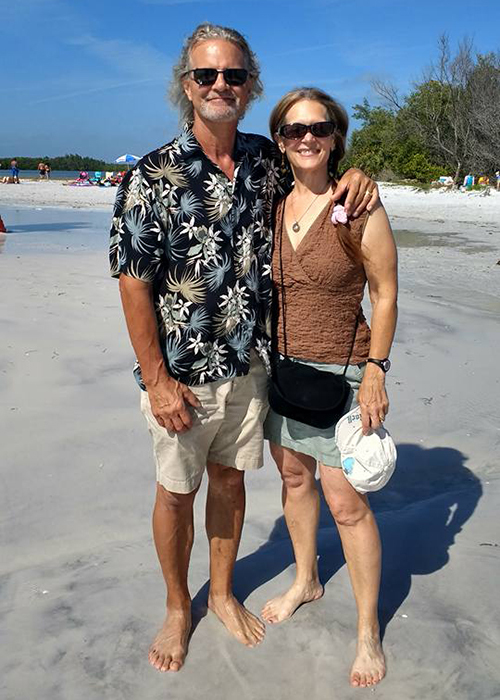 After they retired to New Port Richey, Michael jokes that he found out he couldn’t play golf. MJ was emphatic that the only neighborhood they would consider moving to in St. Petersburg was Kenwood. And she says the community’s designation as an artist enclave was the reason. Four years later, the couple is an intrinsic part of the arts community. MJ has her own air-conditioned studio behind the house and Michael is drawing up plans to turn the garage, where he has his current glass art studio, into a much larger, air-conditioned space to support his work. For more than 20 years, Janna Kennedy-Hyten had a reputation as the “Halloween Lady” in the historic Clinton Hill community of Brooklyn, NY. An accessories costume designer and artisan craftsmen, Kennedy-Hyten hosted an annual over-the-top Halloween celebration that was well attended by the local community. Now she says she might have put her creative talents to work in St. Pete. In September 2018, she moved into Historic Kenwood to be closer to her daughter, who works for the Center for Great Apes, a sanctuary in Wauchula, FL. 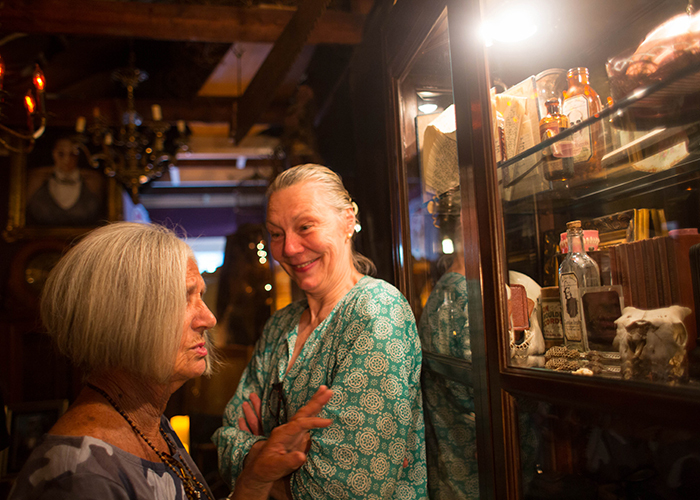 “I had initially thought about moving to St. Augustine and opening a bed and breakfast, but a friend suggested that I consider St. (L-R) Paola Nesmith, a jeweler, checks out Janna Kennedy-Hyten's costume art, and Halloween artifacts, inside her Historic Kenwood home. filled with Victorian-era clothing, furniture and accessories, as well as her artisan crafts, which include unusual handcrafted nests made with vintage threads, copper wire, silk yarn, and other materials. The home of renowned clay artist Jan Richardson was the first stop on the artist tour. Inside Richardson had on display about a dozen of her distinctive hand-built clay houses, paper clay porcelain bowls, and sculptural vessels that she has been creating since 1977. Outside, in Richardson’s plant-filled backyard, 83 Degrees Media photographer Amber Sigman had her outstanding collection of photographs of indigenous people from around the world. 83 Degrees Media featured Sigman’s work in a November 13, 2018 story when she was named one of the 2018 Dali Dozen. 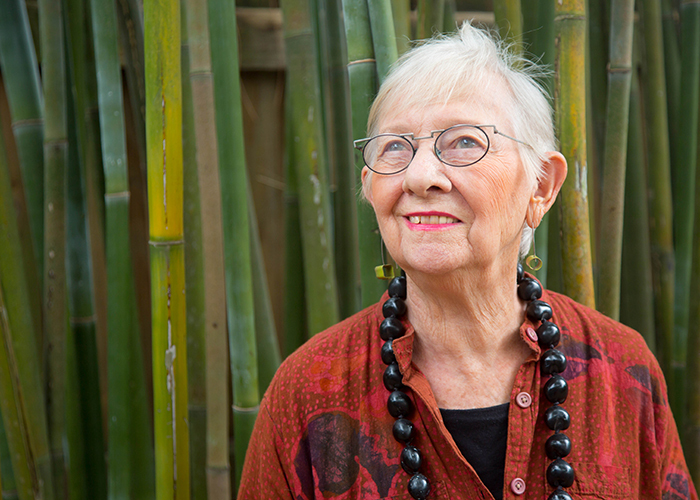 “I bought the house about the same time the artist enclave overlay district Jan Richardson, founder, artist, and designer of Windy Meadows Pottery, and an AEHK member. Richardson doesn’t have her clay studio at home, but rents space at the Morean Center for Clay. “My clay work is very messy and requires kilns in an environment like the Morean,” says Richardson. But she does help organize the artist tour every year. “It’s wonderful for the community to see artists at work in their own environment and it’s also fun for the public to see inside the bungalow homes,” says Richardson.